But That’s What Science IS! This is slide number two from the presentation recently made to the Board of the Houston Peace and Justice Center. 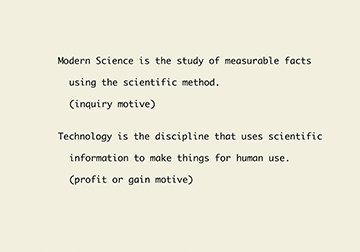 But to be more specific, I should change the above slide to read “modern BASIC SCIENCE.” The goal of good modern basic science is to learn how the ecosystem functions, and to do that we need an unbiased method of communication. Technology is for humans, often with no regard to the ecosystem and what it needs to survive. That’s why I make the distinction between the two. At this point in human history, if we want to succeed as a species and in our communities, we need to understand the ecosystem as she is — not as we wish she were according to our human value systems. Our chances of understanding the ecosystem are slim if we believe the ecosystem functions according to human metaphors. Therefore, If we really want to leave a flourishing culture to our grandchildren, it’s better to know the real facts about what the ecosystem requires for its good health.